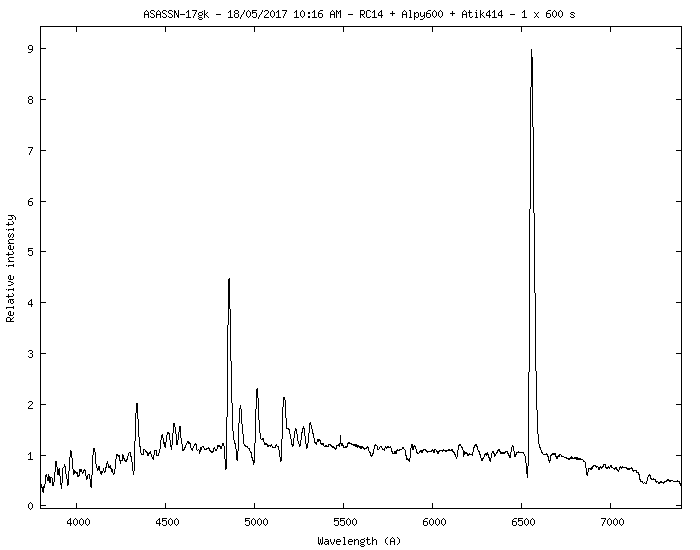 Spectra: Spectroscopy indicating that ASASSN-17gk is a galactic nova was obtained by P. Luckas (International Centre for Radio Astronomy Research, Univ. Western Australia) on 2017 May 18.0598 UT (ATel #10399). His spectrum (non-instrument corrected) may be viewed at asassn-17gk_20170518_428_Paul Luckas.png. Observing recommendations: Observations of all types (visual, CCD, DSLR, spectroscopy) and all bands as instrumentation permits are strongly encouraged as the nova evolves. Charts: Charts with a comparison star sequence for ASASSN-17gk may be created using the AAVSO Variable Star Plotter (VSP). Be sure to include the hyphen in the name as shown. Submit observations: Please submit observations to the AAVSO International Database using the name ASASSN-17gk. Once a GCVS name is announced in an IAU Circular or CBET, please use that name. a. Some of the information in this Alert Notice is taken from ATel #10387 , ATel #10399, and ATel #10404.
b. P. Schmeer (Saarbruecken-Bischmisheim, Germany) reports that a Gaia DR1 source (G=18.767 mag) is located at RA 13 20 55.334, Dec -63 42 19.16 (J2000.0), 0.7" from the reported position of the nova. R. K. Saito (Universidade Federal de Santa Catarina) and D. Minniti (Univ. Andres Bello, Millennium Inst. Astrophysics, Vatican Obs.) report that multiband near-IR VVV observations taken in 2010 show the presence of a faint source (RA 13 20 55.371, Dec -63 42 19.25 (J2000.0)) 0.822 arcsec from the reported target position, and that during 2010-2013 it showed no significant variation in brightness (ATel #10404). Congratulations to the ASAS-SN team on this discovery!